← Giving a fig about halloumi? Who me? And you too? In mid-June 2018, Maggie and I flew into Bergen, Norway, after spending eight delightful days in the Scottish highlands. We had booked two nights’ accommodation in the old centre of Bergen, ahead of a cruise that would take us along the southern coast of Norway before disembarking in the Danish capital, Copenhagen. The soup was delicious, so much so that I had a second helping the following day! I also made a mental note to try my hand at making something similar in our home kitchen back in Melbourne. 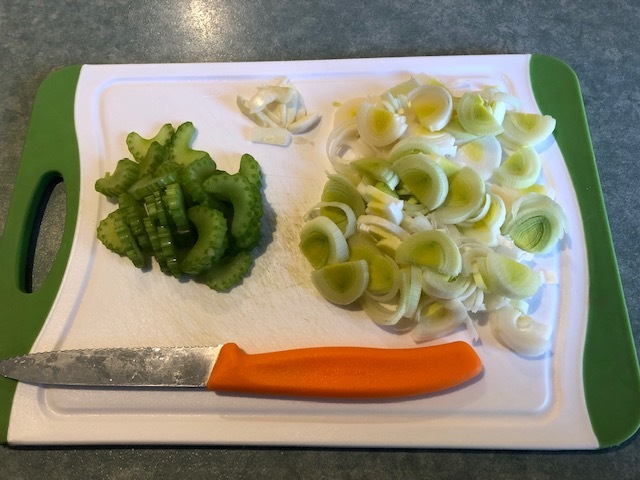 A search of the internet didn’t turn up much that inspired me but I did find a recipe which gave me a sound starting point, from which I could make my way towards something I would enjoy. 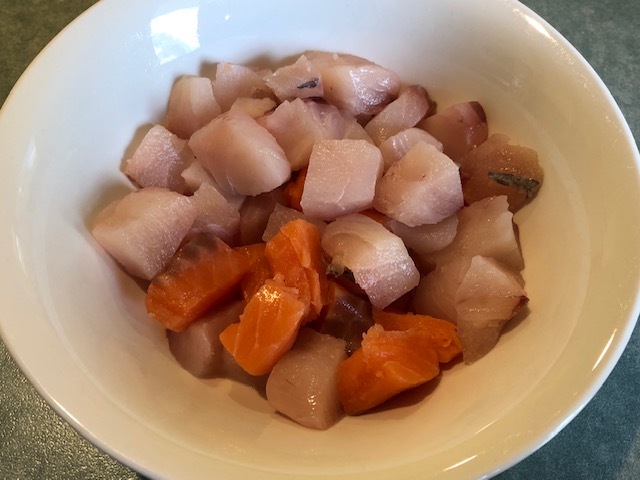 We already have a creamy mussel dish in our repertoire and scallops are a luxury worthy of a higher calling, so my first homemade pot of fish soup contained some pieces of prawn (shrimp) and some 2cm cubes of a firm white-fleshed fish. 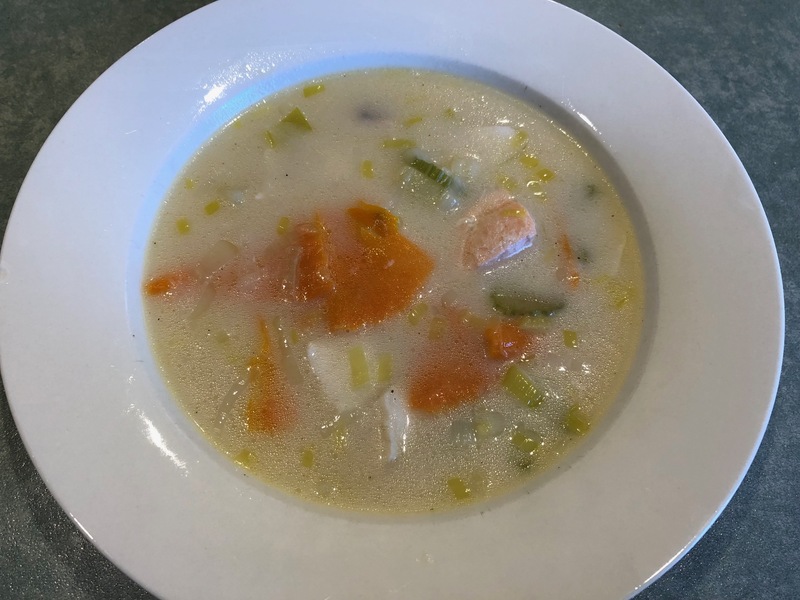 The texture of the cooked prawn flesh didn’t work well with the other, softer elements of the finished soup, so I replaced it with some Atlantic salmon. The only “optional” ingredient I used was potato and I added some soup-friendly celery. I have now made fish soup four times and settled on my recipe. Since my forced conversion to a low-carb routine, I use less potato than specified below. And I would be happy to consider adding some tomato next time, probably in the form of Maggie’s cooked tomato reduction or some slow-baked tomatoes. Melt butter in a heavy-based saucepan over gentle heat, add leek and garlic and sauté for 5 minutes. Add flour, cook for one minute then gradually add stock, stirring constantly. When liquid is simmering, add celery and potato, bring back to a simmer and cook for 5 minutes. And where is the “Danish twist” you might wonder? 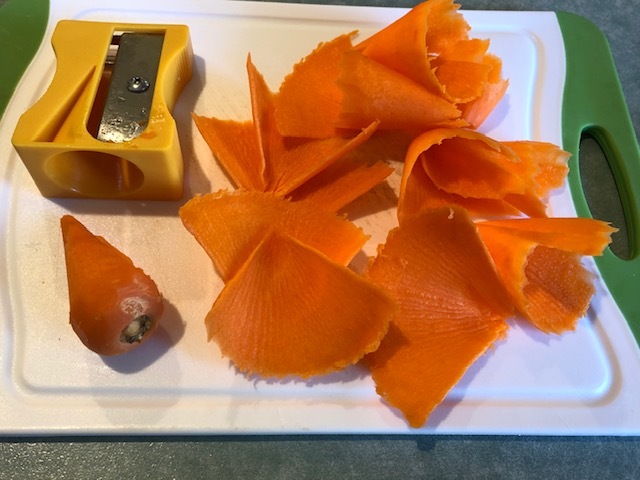 Well, we bought the ‘pencil sharpener’, which produces perfect vegetable wafers, in Copenhagen, a few hours after disembarking from our cruise ship. This entry was posted in Cooking, Eating out, Travel and tagged fish soup, Norwegian fish soup, Viking Cruises. Bookmark the permalink.